NCWTS driver Justin Haley answers a question from Staff Writer Ashton Long. Haley topped the speed chart in the opening practice session. Justin Haley, driver of the No. 24 for GMS Racing, had the fastest speed of the NASCAR Camping World Truck Series first practice session at 178.029 mph and lap time of 31.141 seconds. He also ran the most laps of any driver in the session with 27 laps. Johnny Sauter of GMS Racing and Myatt Snider of ThorSport Racing tied for the second fastest speed with 177.040 mph and 31.315 seconds. The fourth fastest finish went to Stewart Friesen at 176.995 mph (31.323 seconds). Noah Gragson, driver of the No. 18 for Kyle Busch Motorsports, posted the fifth fastest speed at 176.589 mph and lap time of 31.395. Gragson completed 26 laps, the second most laps of anyone in the opening session. 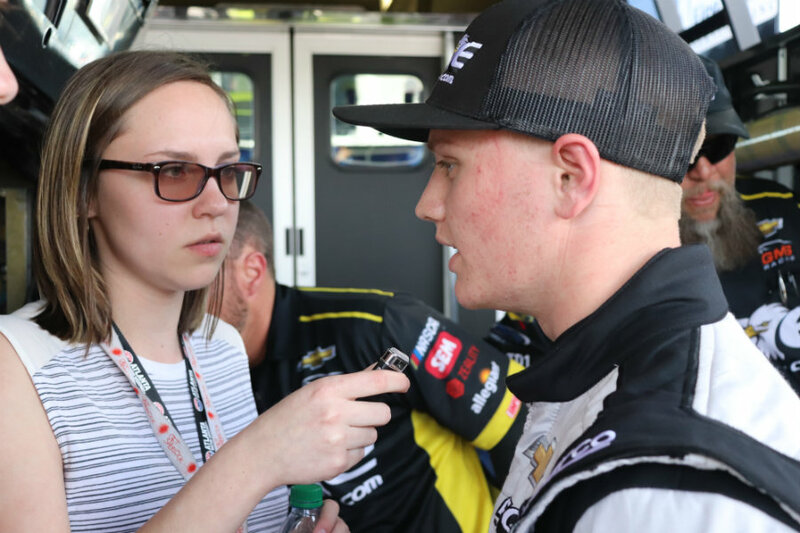 “We just get a mock run, so I think the best thing we can do is to watch the video,” Haley said in preparation for the second practice session later today. Kyle Busch of the No. 4 Cessna Toyota finished 8th with his fastest speed of 176.145 mph and lap time of 31.474 seconds. Matt Crafton finished 12th with a fastest speed of 175.615 mph and lap time of 31.569 seconds. The tenth finish went to Dalton Sargeant of the No. 25 for GMS Racing with a fastest speed of 176.039 mph and lap time of 31.493 seconds. Dawsonville native Spencer Davis, in the No. 51 for Kyle Busch Motorsports, finished sixth with a fastest speed of 176.392 mph and lap time of 31.430 seconds. Austin Hill from Winston, Ga., driver of the No. 02 for Young’s Motorsports, finished 17th with a speed of 173.293 mph and lap time of 31.992 seconds. The NASCAR Camping World Truck Series’ second and final practice session will take place at 4:05 p.m. this afternoon. Noah Gragson topped final practice and maintained the fastest ten-lap average for the session. Gragson drives the No. 18 Safelite Toyota for Kyle Busch Motorsports. After finishing with the fifth fastest speed in the first NASCAR Camping World Truck Series practice session, Noah Gragson, driver of the No. 18 for Kyle Busch Motorsports, finished his final practice with the fastest speed of 178.775 and lap time of 31.011 seconds. Ben Rhodes, driver of the No. 41 Safelite Toyota for Kyle Busch Motorsports, had the second fastest time of 178.775 mph and lap time of 31.011 seconds. After having the fastest speed during the first practice session, Justin Haley finished third in the final practice session with a fastest lap of 176.848 mph, 31.349 seconds. Jesse Little of the No. 97 Wings Over North Georgia Air Show Ford finished fourth with a fastest speed of 176.493 mph and lap time of 31.412 seconds. The fifth finish went to Dalton Sargeant with a fastest speed of 176.364 mph and lap time of 31.435 seconds. 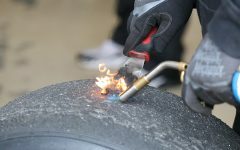 The big topic of conversation all day has been the aged track surface at Atlanta Motor Speedway and its impact on tire wear. Jesse Little, who managed the best ten-lap average in first practice, finished final practice with a ten-lap average of 173.383. Gragson jumped ahead of Little with a ten-lap average of 173.981. Ben Rhodes rounded out the top three with an average of 173.221. Kyle Busch of the No. 4 Cessna Toyota finished sixth with a fastest speed of 176.073 mph and lap time of 31.487 seconds. The No. 21 Allegiant Airlines Chevrolet driver from GMS Racing, Johnny Sauter, finished ninth with a fastest speed of 174.467 mph and lap time of 31.744 seconds. The 12th finish went to Spencer Davis, driver of the No. 51 for Kyle Busch Motorsports, with a fastest time of 174.323 mph and lap time of 31.803 seconds. Winston, Georgia driver Austin Hill finished 18th. The 21st finish went to Korbin Forrister from Cedartown, driver of the No. 7 Tru Clear Global Toyota. Wendell Chavous from Hephzibah finished 26th in final practice. Two drivers, Clay Greenfield and Jennifer Jo Cobb, did not complete laps in the final practice session. 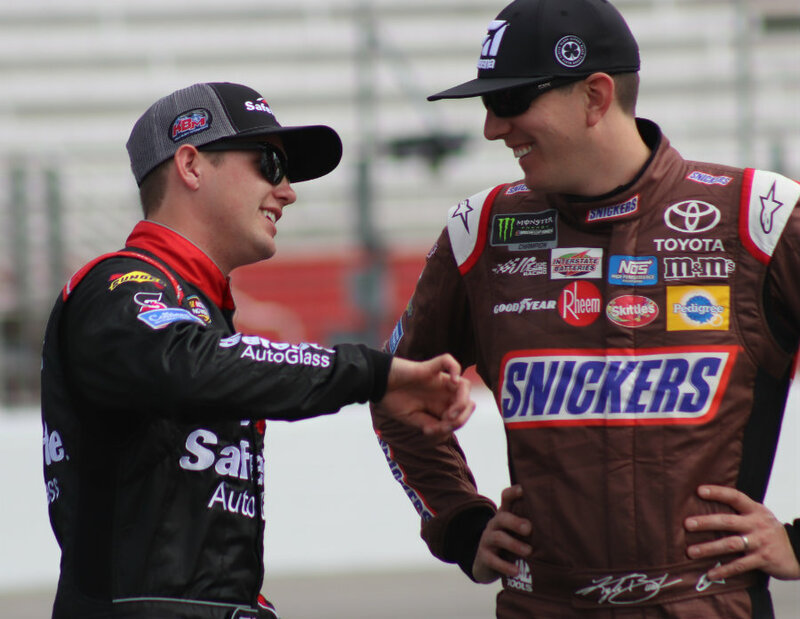 The NASCAR Camping World Truck Series drivers get behind the wheel again tomorrow morning for qualifying at 10:35 a.m.
Kyle Busch (right) talks to his teammate Noah Gragson (left) for Kyle Busch Motorsports. Gragson qualified in the top five, with the third fastest lap time of 30.935 seconds, while Busch captured the pole with a time of 30.844 seconds. Last night’s Monster Energy NASCAR Cup Series top qualifier, Kyle Busch, qualified first for this evening’s Camping World Truck Series race. The driver of the No. 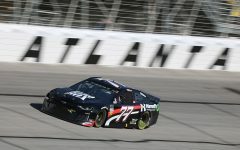 4 Cessna Toyota for Kyle Busch Motorsports captured the top starting position for the Active Pest Control 200 at Atlanta Motor Speedway with a lap time of 30.844 seconds (179.743 mph). Matt Crafton, driver of the No. 88 Rip It/Menards Ford for ThorSport Racing, talks to his crew members after this morning’s NASCAR Camping World Truck Series qualifying session. 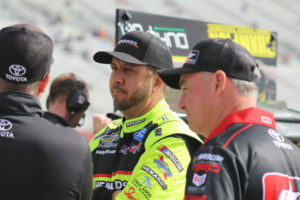 Matt Crafton qualified second behind Kyle Busch, the winner of the Monster Energy NASCAR Cup Series qualifying session. Matt Crafton, driver of the No. 88 Rip It/Menards Ford for ThorSport Racing, qualified with the second fastest lap time of 30.934 seconds. Driving the No. 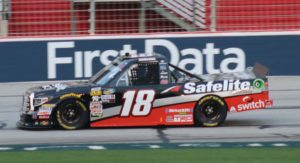 18 Safelite Toyota for Kyle Busch Motorsports, Noah Gragson qualified third with a lap time of 30.935 seconds, only .001 seconds behind Crafton. Spencer Davis, in the No. 51 JBL/Sirius XM Toyota for Kyle Busch Motorsports, had the fourth fastest lap time of 30.996 seconds. Justin Haley, the fifth fastest qualifier for the Camping World truck series, ended with a lap time of 31.011 seconds in the No. 24 Fraternal Order of Eagles Chevrolet for GMS Racing. Other notable drivers included Johnny Sauter, in the No. 21 for GMS Racing, who finished ninth in qualifying. Jesse Little, driver of the No. 97 for JJL Motorsports, who has shown speed all weekend finished 12th. Ben Rhodes of the No. 41 for ThorSport Racing will start 14th, one spot behind Daytona 500 winner, Austin Dillon. 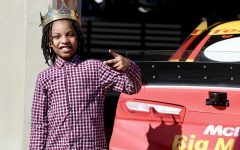 Leading the list of other notable Georgia drivers is Austin Hill, in the No. 02 for Young’s Motorsports, who finished 18th in qualifying. Korbin Forrister, driver of the No. 7 Tru Clear Global Toyota for All Out Motorsports, qualified 21st with a lap time of 31.704 seconds, matching his same position from final practice yesterday. Wendell Chavous, driver of the No. 49 for Premium Motorsports qualified 29th, only 0.200 off of his final practice lap time from yesterday. Tim Viens, in the No. 74 for Mike Harmon Racing, and Travis Kvapil, in the No. 50 for Beaver Motorsports, did not qualify for this evening’s race. 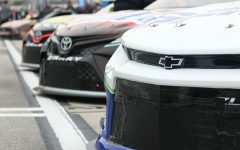 The 10th Running of the Active Pest Control 200 Camping World Truck Series race begins this afternoon at approximately 4:30 p.m.
Brett Moffitt, in the No. 16 AISIN Toyota, finished first after leading only two laps the entire race. With the win, Moffitt and his team, Hattori Racing Enterprises, locked themselves into the NCWTS playoffs. A race led primarily by top qualifier Kyle Busch ended in victory for Brett Moffitt in the No. 16 AISIN Toyota for Hattori Racing Enterprises. Moffitt took the win after leading only the final two laps in a race that ended under NASCAR’s overtime rule. 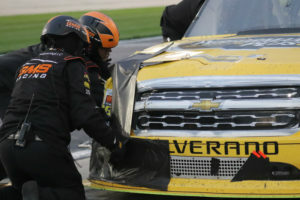 Crew members work to repair Dalton Sargeant’s truck after a late-race wreck with the No. 33 truck driven by Josh Reaume. On the ensuing pit stop, Busch left the pits before the lugnuts on his left rear were completely secured. His tire fell off before he returned to the track, forcing him to pit again and resulting in a 21st place finish. “I knew we were going to launch harder with our JGR motor…[W]e were able to push Kyle to the lead on one [restart]…I tried to give [Snider] enough space where he could spin his tires [and] I could get to the bottom,” Moffitt said of the late-race restart that propelled him to his second career NASCAR Camping World Truck Series victory. As the race turned into the final few laps, the caution flag flew after contact between the No. 33 driven by Josh Reaume and the No. 25 of Dalton Sargeant. Busch’s chances of victory disappeared after leaving his pit stall before all the lugnuts were tight on the left rear. His tire fell off in one turn, forcing him to return to the pits. The mishap resulted in a 21st place finish for the driver who led half the laps in the race. On the ensuing restart, Moffitt sped into first place and the real battle began behind him for second place. Noah Gragson, driver of the No. 18 for Kyle Busch Motorsports, Johnny Sauter, in the No. 21 for GMS Racing, and Ben Rhodes, driver of the No. 41 for ThorSport Racing, finished second, third, and fourth, respectively. Matt Crafton, driver of the No. 2 Rip It/Menards Ford for ThorSport Racing, finished fifth. Stewart Friesen finished in sixth with Myatt Snider, Jesse Little, Grant Enfinger, and Austin Dillon rounding out the top ten. Only four laps into the race, Norm Benning caused the first caution due to a vibration in his No. 6 Zomongo/H&H Transport Chevrolet. A battle for stage points occurred at the tail end of stage one between Busch in the No. 4 Cessna Toyota and Rhodes of the No. 41 Alpha Energy Solutions/Ride TV Ford. Gragson finished first after leading all 40 laps in Stage 1. Crafton ended second with Busch in third, Moffitt in fourth, and Little in fifth. Stage 2 started with Crafton, Sauter, Busch, Moffitt, and Gragson in the top five. Halfway through the relatively calm second stage the caution was called due to debris on the track. While Gragson began to fade as the stage continued, Sauter steadily gained momentum and finished in second, with Busch maintaining a steady lead. Busch, Sauter, Moffitt, Crafton, and Gragson finished in the top five for Stage 2. Busch dominated the previous stage and continued that trend with ease early into the third and final stage. Sauter desperately attempted to catch up with Busch, but failed in his endeavors. With only 20 laps left in the race, Busch led with Sauter in second, Moffitt in third, Rhodes in fourth, and Crafton in fifth. The race win seemed well in-hand for Busch until a wreck occurred with only six laps left as Reaume and Sargeant tangled on the backstretch. 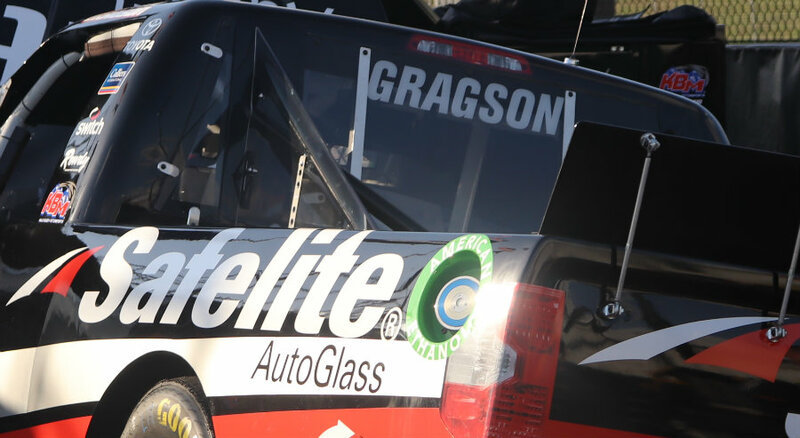 “The tires are our biggest problem and concern for me, because [when] we keep the tire life on it, we are one of the best trucks here,” Gragson said. The caution forced the leaders to pit with everyone taking four tires, except for Myatt Snider in the No. 13 Liberty Tax Ford. It was then that the pit error occurred for Busch, costing him the win. The top Georgia finisher was Dawsonville’s Spencer Davis in the No. 51 JBL/Sirius XM Toyota for Kyle Busch Motorsports as he placed 13th. Korbin Forrister, driver of the No. 7 for All Out Motorsports, came home with 16th place while finishing on the lead lap. Austin Hill of the No. 02 United Rentals Chevrolet finished in the top 20 as well. The NASCAR Camping World Truck Series continues at 9 p.m. next Friday, March 2, at Las Vegas Motor Speedway.